First, a list of posts I particularly want to remember from this year. If any of them sound interesting, feel free to check them out – I’d love to hear what you think. Becoming my own client; also, delegation (Jan) and a conversation about writing, and reflections on taskmasters (Jan) – These two posts fleshed out my approach of choosing what to focus on and treating my self with loving-kindness when it comes to working, as opposed to the taskmaster relationship many people seem to have. On “Hell, yeah! or No” and other approaches (Oct) makes a similar point about the value of activities I don’t enjoy as much as my main ones. Dealing with uncertainty one step at a time (Nov) – I realized that my desire for certainty was an illusion, and that embracing uncertainty could help me be of more use. Stoic impressions: Weebles wobble but they don’t fall down (July) uses a playful metaphor for this. On a related note, Reflecting on risk aversion showed me that although I feel like I’m becoming more risk-averse, when I look at my decisions, they’re actually getting bigger and more confident. Odd. What could I do if I showed up in a bigger way? (Nov) – Among the different communities I care about, Emacs still tickles my brain the most. Combining that with my reflection on figuring out a path to awesomeness (Nov), I think it makes sense for me to focus on building bridges. What’s in your handbook? (July) – I collected the different mantras and reminders I use. Developing opinions (July) – This gave me a process for learning about things when I don’t want to settle for what books suggest I think. Goal factoring, reflecting on what I can do with my time, and enjoying a buffet of goals (March) – This was a great metaphor that helped me make more sense of having multiple interests. A No-Excuses Guide to Blogging (PDF, EPUB, MOBI – free! ); also, notes on publishing (Feb) – This resonated with a lot of people. Stepping up to publishing (Feb) – In which I realized that it’s good to provide ways for people to be part of your tribe if they want to. What you’re really there to learn in computer science (Feb) – Also resonated with a lot of people. I wish I’d realized this when I was teaching introductory computer science. I would have said it up front. Second, a snapshot of everyday life, so that I can remember what it was like at this time. My routines haven’t changed much since last year, except perhaps that I spend more time writing, cooking, and snuggling with W- and the cats. I try to drop by my consulting client on Thursdays, having successfully off-loaded most of my responsibilities to the team members I’ve trained. I go to Hacklab most Tuesdays to help cook a free vegan dinner for the open house; it’s enjoyable cooking practice, and sometimes I get interesting conversations out of it. W- has taken on a bigger role at work, but that still gives us plenty of time for family projects (we’re working on the basement at the moment). J- often has friends over to study and hang out, so we keep the house stocked with a variety of snacks. We took our cat Leia for a lion cut to deal with some of the mats in her fur. It was very amusing. 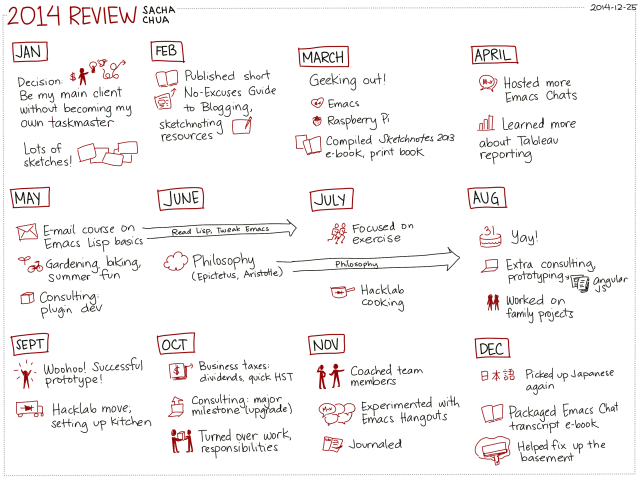 I started keeping a more deliberate private journal using Org Mode and Evernote. It’s a good complement to blog posts. Mixed results in the garden, but we were pleasantly surprised by getting one zucchini, two bitter melons, and two winter melons out of it. We’ll keep trying. I became a Canadian citizen! I’ve been remiss about actually applying for the passport, though. I’ll get that sorted out soon. In 2013, I resolved to spend more time focusing on my own things instead of giving in to the pull of consulting. So in 2014, I collected more resources into e-books (and even one print book). I experimented with writing a four-part course. I took a Coursera class on analyzing data with R. I played around with Emacs and wrote blog posts for hours. And yet my data tells me I actually spent more time working on other people’s projects. It went from 9% of my time in 2013 to 12% of my time in 2014, which works out to about six additional hours extra per week. This is coincidentally the same number of hours I reduced my socializing by, although a chunk of that can be explained by shifting socializing to Hacklab (which I track under Business – Connect). The special project I did in September really changed the balance (27.5% of my time in that month! ), as did the fact that I didn’t take any month-long breaks. Even hermit-mode November involved working from home 6% of the time (~10 hours a week). It’s funny how perception doesn’t match data. Despite the extra time spent consulting, I felt a lot more self-directed this year – maybe because I produced more tangible stuff, and my tasks were more aligned with each other. But I’m drifting off course from becoming my own main client, and I want to adjust that heading in 2015. Tableau: I learned how to take advantage of custom SQL and filter actions, and I became more comfortable with calculated fields, parameters, and filters. NodeJS and AngularJS: I built a prototype survey tool that also automated other things we wanted to do during a special event. Rails 4: I finally upgraded quantifiedawesome.com to Rails 4. Also, Emacs Chats and Emacs Hangouts have been awesomely fun and inspiring. Can’t wait to set up more of them! In terms of writing, I got better at working with outlines as a way to organize my thoughts within each blog post. I’m still working on getting the hang of outlines to help me organize my thoughts across multiple blog-post-sized chunks, but the basic Emacs Lisp course was a good start. I also started building up an Emacs Org to EPUB/MOBI/PDF workflow for quick publishing and updating, so that I can can get more e-books up on Gumroad. Because I offer these resources on a free/pay-what-you-want basis, every time someone does buy it, I’m delighted to have that opportunity to connect. Smooth consulting transitions: We’re on the way there, I think. I’ve been training one of the team members to cover the work I used to do, which is great. More initiative-taking: Yes, especially in terms of professional development and publishing. I’m getting better at figuring out what I would like to learn and how to try things out. Cardio and strength exercise habits: W- shared the Couch-to-5K program he picked up at work. We’d gotten all the way through it together (even though I covered much less distance than he did), but then I had to drop the habit because of other considerations. I’d also started the Exercise Ladder, but it got hit by the same restrictions. We’ll see how next year turns out! It’s good to know that I can do it and enjoy it, and I’m looking forward to starting even if I have to start from scratch. Intentional interaction: I love spending time with W-. I’ve also been spending more time connecting with people in person at Hacklab open houses (at which folks are welcome to visit me, too, so it’s a great way to have low-commitment conversations). I feel great about my online conversations, too; there’s resonance there.On the flipside, I spent less time setting up get-togethers in person or treating people to lunch. I didn’t bother with a birthday party for the second year in a row; I realized I enjoy the peace and quiet. I’ve been pulling myself in, focusing on a small core. Still, compared to last year, this year’s interactions feel more natural and more relaxed for me. Perhaps I’m more selfish and withdrawn than the ideal, but I’ll grow at my own pace. I’m probably going to stay similarly reserved in 2015 to give myself space to explore things, but I’ll reconsider this in 2016. Simple living: Wow, Epictetus, dude. You do make it easier to separate what’s important and what’s just nice to have. Aristotle has a lot to say about the good life, and Seneca has something to say about the short life. Good stuff.This year, I let go of quite a few anxieties, attachments, previously-unexamined commitments, and desires. I am getting a little attached to flexibility, though, so that’s something I may want to experiment with. More harvesting and sharing: That worked out well. I’m excited about writing bigger chunks with outlines and using my publishing workflow to package even more useful resources. This will be fun. It’s been a good year for the stock market, although all of that is still paper gains for me since I haven’t sold any stocks and all my dividends are reinvested. We had some pretty large expenses (in line with our priorities, at least) that required me to dip into my savings. I issued my first dividends last year, so if things work out the way I expect them to at tax-time, planning should be smoother. Hmm. I didn’t spend that much more time, but it feels a little awesomer this year; the posts grew into more conversations with people, and I learned more from those. Maybe it’s that test-driven learning thing. What you learn becomes more real to you and more useful to others when you create something from it, so it can make sense to aim for creating something from the beginning. Experiment update: 2015 will be the fourth year of my five-year experiment. Boggle! When I thought about what five years looked like in 2012, it felt like such a big space – more than university, more than the time I spent at IBM. The first year, I learned how to experiment with business models, hitting the ground running with consulting. The second year, I focused on consulting and event sketchnoting. The third year (2014), I scaled down consulting so that I could learn more about creating. 2014 was the year that people’s generosity showed me that I really like writing as a way of creating value. There were countless conversations and even the occasional purchase of free/pay-what-you-want (PWYW) resources. I liked waking up in the morning to a notification that someone had decided to express their appreciation and invest in me (and themselves!). I liked the responses to my thank-you notes, the questions and suggestions and ideas. It was more of a gentle thrum rather than the highs and lows of programming, but I liked it. If my life can continue to fit within investments and savings and little streams of income, I’d like to keep doing this. It’s not going to be an extravagant life, but there’s room for what’s important. So the fourth year, 2015, will be a good opportunity to explore sharing further. Can I keep this going through the extra uncertainty we might be dealing with next year? Can I create and receive value with this commitment to openness instead of following the trend toward exclusive courses and premium content? Can I build resources that will save or improve 10-100 hours of people’s lives so that they’re willing to give me the equivalent of a few of their hours to make this even better? It’ll be fun. =) Thanks for great year! 2007: wrapped up thesis, graduated with M.A.Sc., started working at IBM; no review? 2006: grad school, getting used to Canada; no review?